It’s family vacation time. You’ve picked the destination, you’ve discussed budget and you’re researching airfare when it occurs to you: Is it cheaper to fly or drive? Is it safer to fly or drive? Whether flying is better than driving depends on several factors. 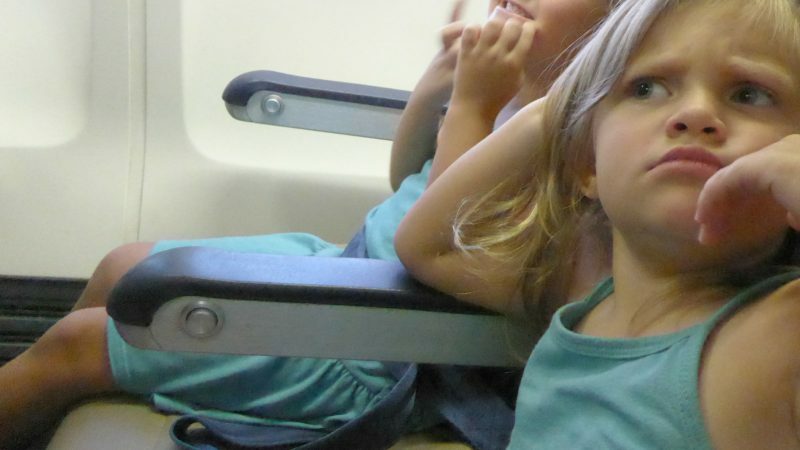 We break down your family travel need-to-knows to help you decide: Should I fly or drive? For some folks it’s not even a question. They are Team Fly or Team Drive. Before you decide to fly or drive you need to ask yourself – do I even like road trips? Do airports make my skin crawl? The best vacation is the one that you feel like you have some control over. If you pick a transportation mode you hate and only save a little bit of money, you’ll regret it. A price tag cannot be put on a low stress level. Let’s weigh the pros and cons of flying vs. driving, shall we? Hidden flight costs to consider. Are there good road trip stops on your route? Hidden road trip costs to consider. How busy is your vacation? Yup, that’s right. Before you even start planning consider: do you have a potty training toddler? A kid who pukes on every drive over an hour? A teen with an intense fear of flying? Think about whether you have the band with to deal with high emotions before you even get to where you’re going. Let me share my personal experience. I have four kids. I solo road trip with them every summer to see my parents. For us, it’s usually cheaper to drive. It gives me the freedom to stop when we need to and I don’t need to worry about them bothering anyone but me. We’ve made some great memories together. If it’s my oldest or my husband, baby and me? We usually only have a few days and try to go somewhere we can get a rocking flight deal. First, sit down and really add up the time. How many hours away are you going? How many hours do you live from the nearest airport? What do the flight times look like? You can use a fly or drive calculator like the one from BeFrugal. Just remember there is “human knowledge” to be considered as well. For instance, if the only flights are midday but you could leave early in the morning and drive all day and get there at the same time? That might alter your decision and make driving a better option. Check out BeFrugal and let us know what you think! Mapquest the distance to your destination. Search flights to get an idea of ticket prices. Kayak is a great way to compare flights and search multiple airports if you have several options nearby. If you are looking at Southwest, you’ll need to go directly to their site. They don’t show ticket prices on Kayak. Make sure that you add in any additional fees for selecting a seat or baggage fees when you calculate your flight price. It will not show automatically. Read More: Want to know what low cost airline fees are? Find out the real cost of your ticket. How far are you going? Is flying worth it? Flying can cut down 13 hours of driving to a manageable three hour flight. How much time does air travel truly take though? You’ll need to add in drive time to the airport, arriving roughly two hours early for check-in, potential delays, the flight duration itself, time to get off the plane and gather luggage at baggage claim and the time to rent a car/board a shuttle and arrive at your lodging. This can easily end up adding up to 11 hours or so. For drives that require an overnight, we always look at air travel first. If there is a deal, then the time saved typically makes it worth it to us. 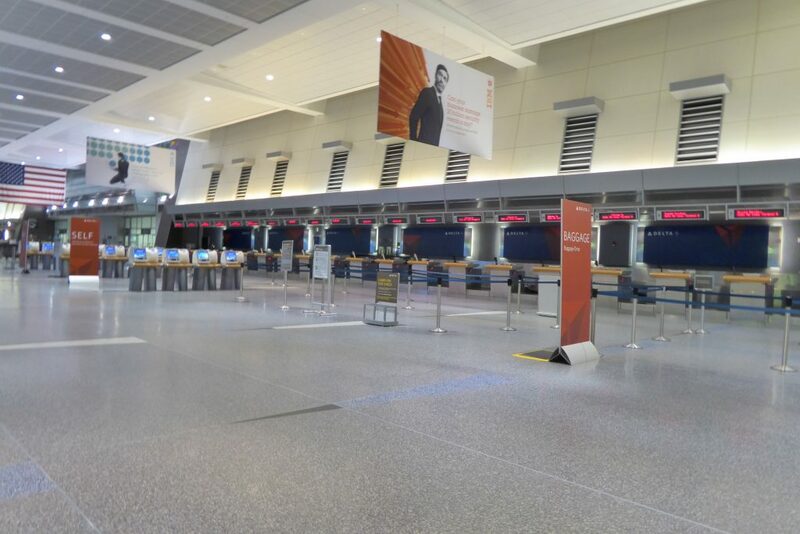 For drives under six hours, we will traditionally drive just because our airport drive + check-in time + wait time+ flight time+ baggage claim time + transportation at destination time will always add up to more than our drive time. Fly or Drive? How many days is your trip? In the ranking of things to consider when you deliberate driving instead of flying, the length of your trip ranks right near the top. 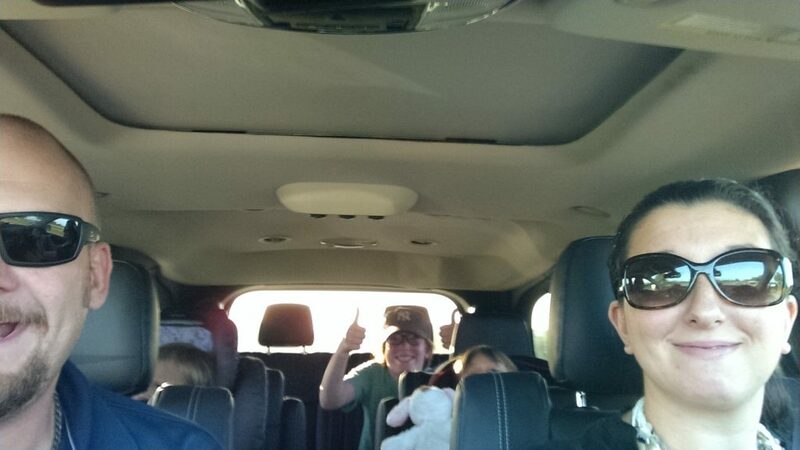 If it’s a short trip, do you really want to eat into precious family vacation time with hours on the road? Flying might be a better option. For trips of four days or less, we are typically not willing to drive more than five hours each way. Travel dates can play a role too. For long weekend getaways over holidays, the mantra “stay close or fly” helps you avoid traffic and tears during hectic travel dates. The number of travelers has the largest impact on whether to fly or drive. Big families are well aware of this struggle. Flights can be pricey and when you have five or more people flying, driving costs starts to look really good. Be sure to calculate the per-person cost for the trip. The more people in your party, the more economical it becomes to drive – if you have a vehicle that can accommodate you. Which brings us to our next point. Can my car handle the road trip? Do you have a vehicle large enough for the number of people you plan to road trip with? Is your vehicle mechanically ready for the mileage? There is absolutely zero to be gained financially if you run up a bunch of miles on your vehicle and end up needing to pay for repairs. If driving is on your radar, it can be worth it to look at rental car prices in your area. Rental car prices typically run the best rate around the 5-9 day duration and become less cost effective after that. When we went to Big Bend National Park, we chose to rent a car that we would be able to drive in the park. Some roads need a high clearance vehicle like a Jeep, since the terrain isn’t minivan worthy. The $300 driving costs for the four day trip was worth it to us because we drove more than 1500 miles and were able to enter more areas of the park. Read More: Find out what tool to use to save money on your car rental and why you shouldn’t rent at an airport unless you have to. We also love how Your Mechanic lays out the fly vs. drive questions in their post. Check it out here. Is the travel planned or a last minute vacation? Planning in advance pairs well with airline tickets. Last minute plane tickets can be pretty pricey unless you’re grabbing a special sale and not picky on destination. We encourage spontaneity though. If you pick a destination based on specials you may discover a new favorite. Always be sure to double check hotel costs and rental car prices before booking a deal fare though. When you look at flight costs, be sure to always wrap in a little wiggle room. Account for plane tickets, airport parking, hotel costs if it’s an early flight, food at the airport, potential delay time, travel insurance (which we always recommend), baggage fees, fees to get a seat on the plane, meal/snack costs in flight, in flight wifi or entertainment costs if you’ll utilize them, rental car costs when you arrive at your destination and the cost of appropriate luggage if you don’t have any. Remember that flights within the United States sometimes have larger baggage allowances for carry on luggage than those headed to Europe. For airport parking be sure to book in advance to ensure that the cheaper lots have a spot waiting for you. Fly vs. drive: Are there good stops along the way? There is a quote out there often attributed to Ralph Waldo Emerson, “Life is a journey, not a destination.” This quote can ring true on your travels as well. Some of our family’s favorite memories of vacations are places we stumbled across by accident. Discover the United States! However, if your flight is going to take you across hundreds of miles of plains, canyons and little else, then great. You’ve saved yourself hours of boredom and difficult driving. Road fatigue is a real thing. However, if your drive wanders through a bunch of little towns, historical markers and maybe even passes the world’s largest fork (yes, that’s a real thing) then maybe the trip can be about more than the destination. Hidden driving costs to consider. When you calculate driving costs, be sure to factor in money for hotel rooms, gas prices, snacks and meals, tolls, parking costs at city hotels, AAA membership, a pre-trip check up for your car, parking and speeding tickets (follow the road rules!) and depreciation. 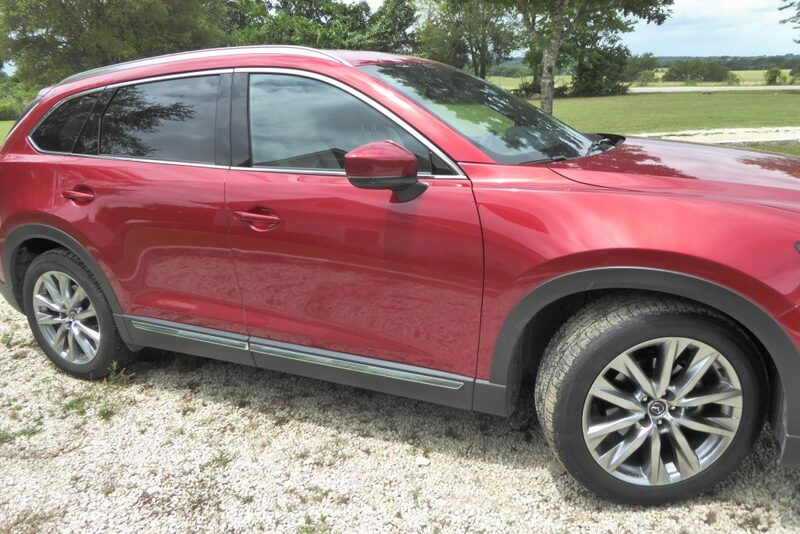 Putting thousands of cross-country miles on your car can depreciate the value of it. This may cost if you are looking at selling or trading it in in the near future. Other things to keep in mind are that car seat rules are different in other states. We were driving from Florida up to New Hampshire to see my parents. My 8 year old is tall and meets all height and weight requirements for a seat belt in our state. We hit Virginia and I started seeing signs about car seats and ages. She wasn’t old enough under their rules. That resulted in a frantic Target run to purchase a MiFold so that I wouldn’t end up with any unexpected ticket expenses. This also goes for cell phone rules. You may need to factor in the cost of a good headset if your car doesn’t have hands free Bluetooth. Hint: Check out our long distance road trip tips if you’re headed cross-country! How hectic is the vacation once you get there? Is driving to Disney worth it? Let’s face it: the biggest question of fly vs. drive comes from readers who want to know, “Should I drive to Disney?” This is a personal decision to make. For many folks, driving is one way to save money on a Disney vacation. Be realistic though. If you are going to spend 17 hours in car then try to pack in four days at Disney, you need to consider your stress level and that of the kids. 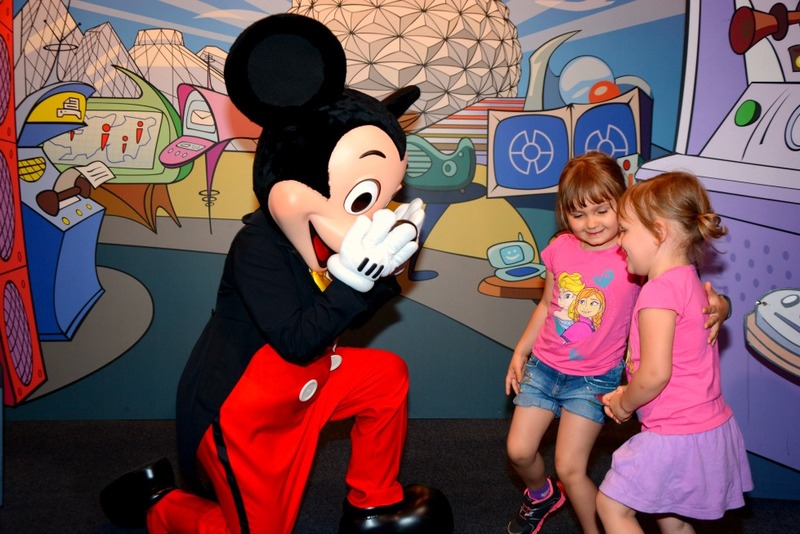 Disney is an exciting trip and for many folks a huge investment of family vacation dollars. With the availability of Disney’s Magical Express (free transportation from the airport to onsite resorts) and frequent sale fares to Orlando, I advocate flying if it is your first trip to Disney. Read More: This mom lays out why she’ll never drive to Walt Disney World again. Holiday weeks, busy times and high fares can necessitate driving. Be sure to check your resort’s parking fees when making your calculations on the cost of flying vs driving. Want the best of both worlds? Don’t feel like you’re stuck with either a road trip or air travel. Instead of thinking round-trip, check out one way rental car specials. These specials can be found near Walt Disney World in Florida several times a year. We love to fly in and get to the parks to play. Then we grab a one way rental on the special fares and drive home. Our savings are better than round-trip plane ticket costs or round-trip driving costs. We were able to grab an SUV that fit all six of us for $15/day in 2018. Pick the best option for your family. 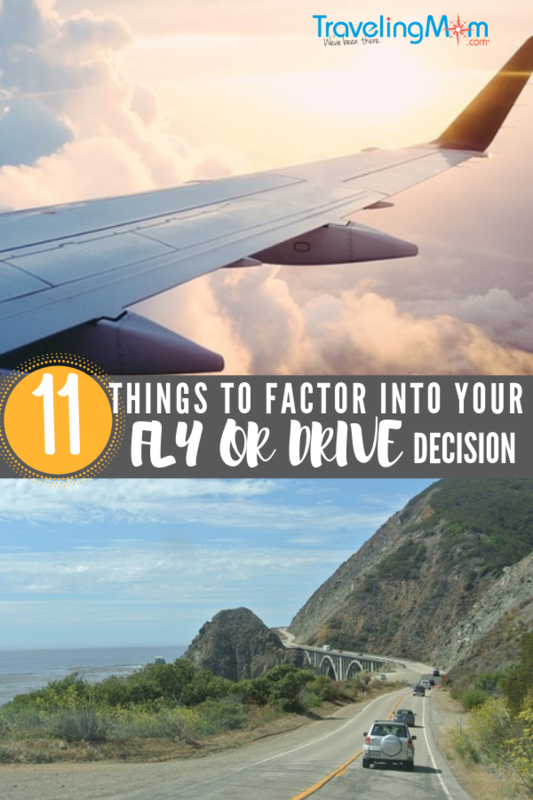 After considering everything, you need to decide which is a better option for you – flying or driving! Either way we’re excited that you are headed out to travel and wish you the best.